Planning education involves engaging students in many ‘wicked’ planning problems of which climate change is a particularly testing example. This paper demonstrates that by thinking about climate change problems for urban and regional places, educators are reminded about the importance of some more generic but essential capabilities required of planners in dealing with a range of challenging problems. 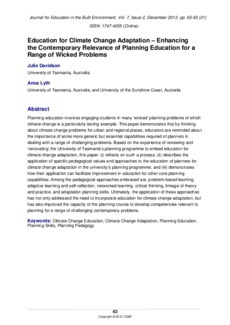 Based on the experience of reviewing and ‘renovating’ the University of Tasmania’s planning programme to embed education for climate change adaptation, this paper: (i) reflects on such a process; (ii) describes the application of specific pedagogical values and approaches to the education of planners for climate change adaptation in the university’s planning programme; and (iii) demonstrates how their application can facilitate improvement in education for other core planning capabilities. Among the pedagogical approaches embraced are: problem-based learning, adaptive learning and self-reflection, networked learning, critical thinking, linkage of theory and practice, and adaptation planning skills. Ultimately, the application of these approaches has not only addressed the need to incorporate education for climate change adaptation, but has also improved the capacity of the planning course to develop competencies relevant to planning for a range of challenging contemporary problems.